He was ultimately accepted by J. At his 1954 security clearance hearings he denied being a member of the Communist Party but identified himself as a fellow traveler which he defined as someone who agrees with many of the goals of Communism but without being willing to blindly follow orders from any Communist party apparatus. Birge wanted him so badly that he expressed a willingness to share him with Caltech. Johnson presented) him with the Enrico Fermi Award as a gesture of political rehabilitation. 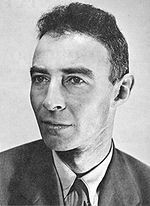 Julius Robert Oppenheimer (April 22 1904 – February 18 1967) was an American theoretical physicist and professor of physics at the University of California Berkeley. The first atomic bomb was detonated on July 16 1945 in the Trinity test in New Mexico; Oppenheimer remarked later that it brought to mind words from the Bhagavad Gita: "Now I am become Death the destroyer of worlds.